Thinking about bathing a dog or giving a haircut can sound like quite a chore. These two activities are part of grooming, but the term in general encompasses a lot more and at the same time doesn’t have to be difficult to manage. Grooming in dog terms is very similar to grooming in the human routine – something we do every day! Grooming a canine is head to tail maintenance of the body. It includes caring for the coat (hair), skin, teeth and nails. The importance of regular grooming goes beyond appearance – it is one of the most substantial things you can do to ensure general wellbeing. Of course, you can groom your animal yourself or take them to a professional. Many pet parents make the decision on how to approach this based on their dog’s coat. 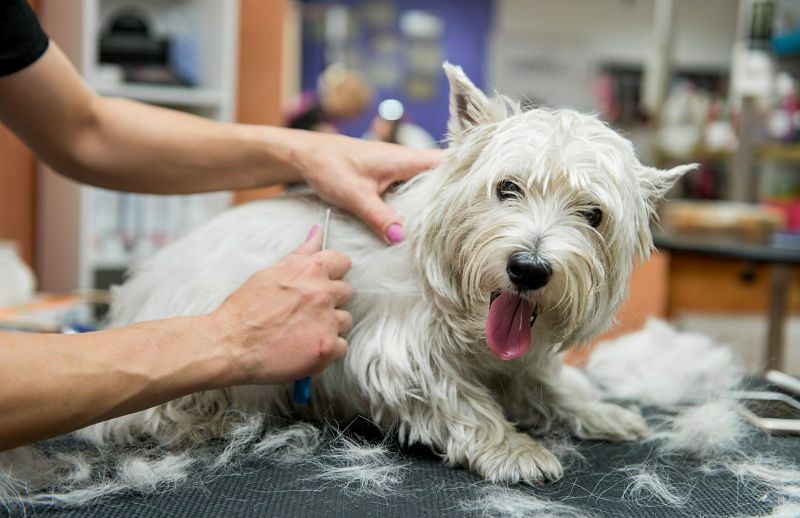 If a dog has hair that must be cut often, professionals can offer a better cut with a lot less time and effort. The benefits of a well-cared for animal can be found throughout the body. Teeth should be brushed regularly or professionally cleaned by a vet regularly to keep tartar buildup in check and prevent gum infections, which are common in dogs. Gum infections can progress into serious gum disease, bad breath and lead to infections of other organs. Nails must be cared for monthly as well. Allowing them to become too long makes walking difficult and can lead to orthotic issues. It’s also tough on your home, furniture and body if the dog jumps up on you. Brushing, washing and trimming of the coat helps to keep it clean and smooth. Regular brushing prevents matts and removes dirt and parasites. Matts can become very painful for an animal and often harbor sores and parasites underneath. Brushing also helps to distribute sebum, a natural skin oil, throughout the coat and over the skin to keep it moist, shiny and healthy. Cleaning of the ears is important for many breeds with large ear flaps to keep them dry and free of bacterial and yeast infections. Finally, regular grooming is like a regular checkup for your pet. Because a good groom requires physical contact and inspection of the entire body exterior, it often catches internal problems before they become serious. For example, an ear infection, gum infection, fleas or ticks and tender spots.